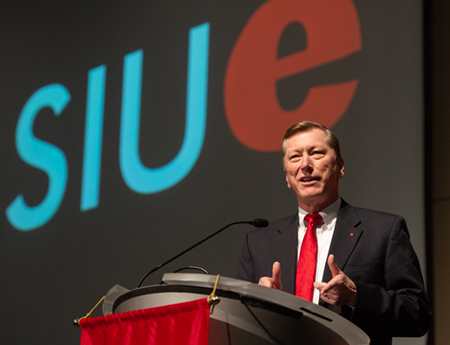 SIUE Chancellor Randy Pembrook, PhD, echoed Schoenecker’s remarks on the life-changing impact scholarships make in students’ lives. He emphasized that data shows when considering an individual’s overall life financial position, and financial health and wellness, college access and college graduation are the number one predictor in terms of positive outcomes. Awards were presented to students studying in each of the School’s academic departments, including accounting, business administration, computer management and information systems (CMIS), economics and finance, and management and marketing. Among the awards was the inaugural Gateway to Innovation Scholarship which was presented to Jenna Winningham, a junior CMIS major. The scholarship aims to encourage and inspire students in the fields of information systems and computer science. Additionally, nine students were honored with the Delta Sigma Pi Key Award for achieving a 4.0 grade point average. The event’s guest speaker was SIUE Vice Chancellor for Administration Rich Walker, MPA. Walker spoke of the impact others made by investing in him, just as he, and other donors and donor organizations are doing for current students. Walker encouraged students to make sure they are a good investment. He concluded by fulfilling his speech’s original goal of describing how to get a good night’s sleep. 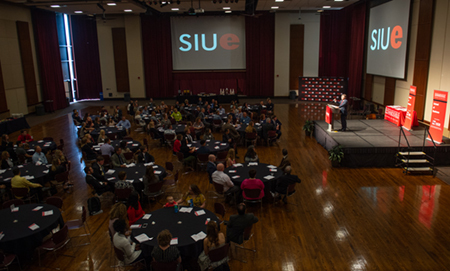 Photos: More than 100 students received scholarship awards valued at over $200,000 during the SIUE School of Business Scholarships and Awards Program. 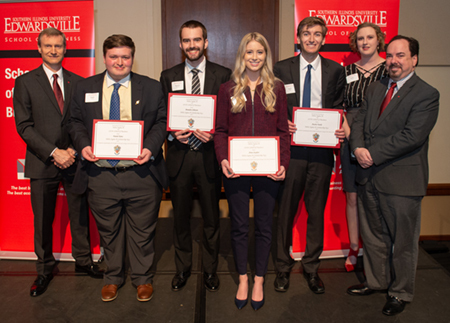 Nine School of Business students were honored with the Delta Sigma Pi Key Award for achieving a 4.0 grade point average. Guest speaker Rich Walker encouraged students to be a good investment.